Tax Day is tomorrow…. With the help of Forbes we have rounded up some Tax Day Deals and Freebies in our area to help celebrate Tax Day being behind us. Take advantage of these deals whether it be a discounted before school breakfast for the kiddos, a treat or a discounted hotel stay. On Tuesday, April 17, any guest who dines in-restaurant at Boston Market can get a $10.40 Tax Day Meal Special, which includes a Half Chicken Individual Meal with 2 sides, cornbread, a regular fountain beverage and a cookie. Bruegger’s Bagels brings back its annual Tax Day deal for a whole week, April 11-17, to match the extended tax filing season and lighten taxpayers’ load. Starting April 11, participating bakeries will offer Bruegger’s famous Big Bagel Bundle for just $10.40 with a downloadable coupon from the company’s website– a significant $3.50 “deduction” from the standard price. 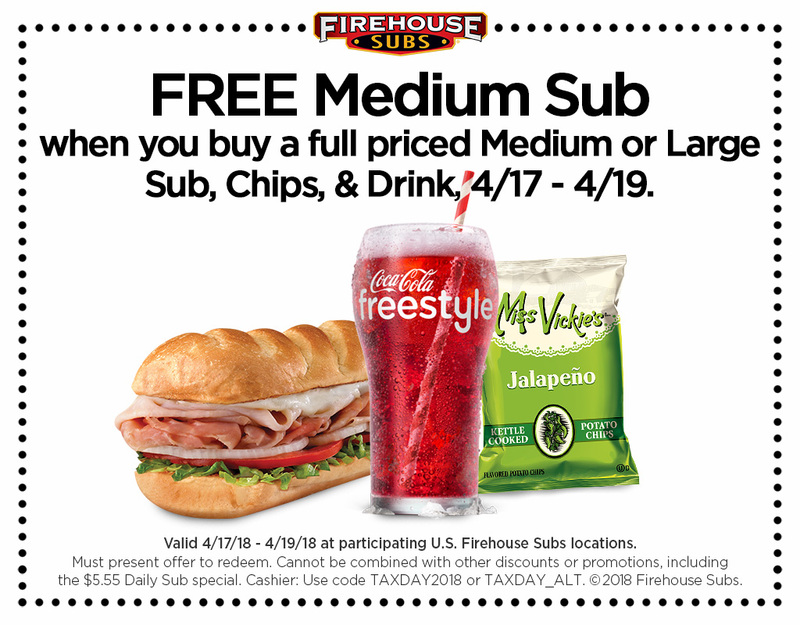 Firehouse Subs is inviting guests to stop by to receive a free medium sub when they purchase a full price medium or large sub, chips and a drink (valid Tuesday, April 17 through Thursday, April 19, 2018). Please click here for a link to the offer. Chuck E Cheese. This tax season, families can enjoy a guaranteed return at Chuck E. Cheese. The Tax Day (Tue, 4/17 – Thurs, 4/19) offer: Buy any large pizza, get one large cheese pizza free. U.S. only. The Hamilton Hotel Washington D.C. Located in the heart of D.C., The Hamilton Hotel is offering a special “$1.4 Trillion Dollar Cocktail” – a delicious respite from the steadily rising national deficit – made with “conservative” amounts of Absolut Elyx, Blood Oranges, Elderflower Liquor and Passion Fruit Juice at the hotel’s restaurant and bar, 14k Restaurant. Appropriately priced at $14, the Hamilton Hotel encourages patrons to write this boozy cocktail off and de-stress this Tax Day. P.F. Chang’s On April 17, this popular Asian-themed chain is giving a 15% discount to diners at every location across the country. Discount not valid on drinks or Happy Hour food. Tax Day is here and Potbelly Sandwich Shop is offering deals that will put some ease on your wallet. Customers who sign up for Potbelly Perks by downloading the Potbelly app (iPhone/Android) or online will receive a free sandwich (the free sandwich offer ends when 75,000 sandwiches have been given away). Those already enrolled in Potbelly Perks can enjoy a BOGO Sandwich that will automatically load into the app for redemption on Tax Day (April 17). Marriott International in DC. Marriott International’s hotels in Washington, DC are encouraging travelers to enjoy their “returns” and do more by saving more with the Tax Day Deal. For two weeks only, April 11 through April 25, 2018, travelers can save up to 25% off best available weekend rates for stays June 29 – September 3, 2018. Rates are per room and exclude tax and gratuities. Offer valid Friday through Sunday. Terms and conditions apply. To book your reservation at participating hotels click here , and refer to promotional code SPU. The Omni Homestead Resort. The Omni Homestead Resort in Hot Springs, VA, is offering a special: Book one night and the second night is just $25. You must book by 4/20/2018; valid for stays between 4/17/2018 – 12/22/2018. Thinking of spending your tax refund in Europe? Rail Europe is offering travelers $25 off for $400 bookings made through April 24. Use code: TAXDAYRE18.